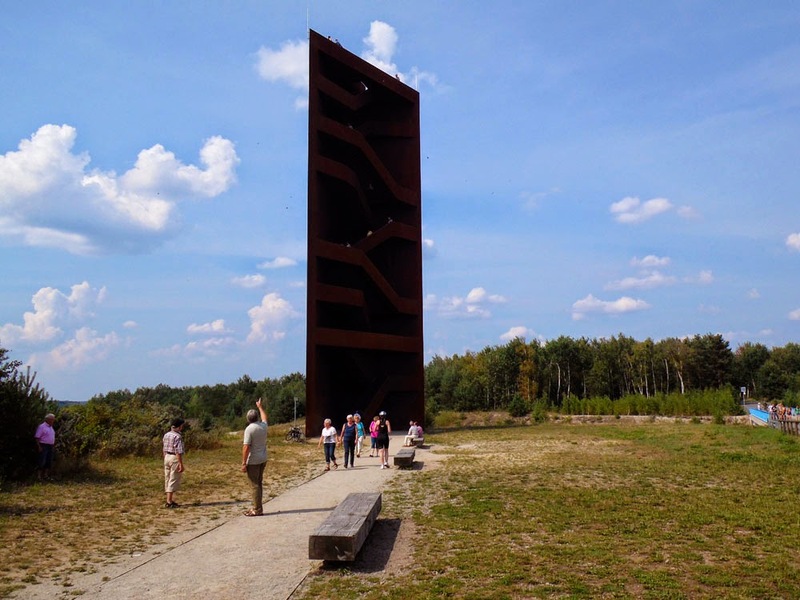 Continuing our exploration of Niederlausitz (SE Brandenburg) after our cycle from Lauchhammer along the Schwarze Elster, yesterday we took a train to Spremberg and cycled to Senftenberg. This took us through a region known as the Lusation Lake District, or Lausitzer Seenland. 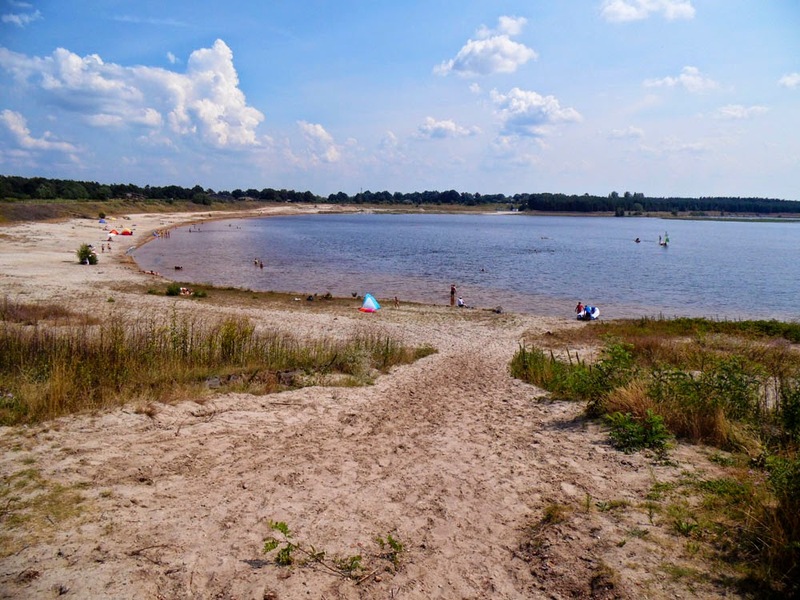 This is a totally unique landscape where the huge deep moonscape-like scars of lignite strip-mining (like here near Cottbus) have been flooded with natural water and 'terra-formed' into beautiful lakes where wildlife flourishes and people flock to sunbathe on the lake-side beaches or sail and wind-surf on the clear waters. It was promising to be hot and sunny, with temperatures reaching over thirty degrees, and we had fifty kilometres peddling ahead of us. So we slapped on with the factor 30 sun-block, filled our water flasks to max, and caught a Reginal Express to Spremberg (1 hour 50 mins, change at Cottbus). 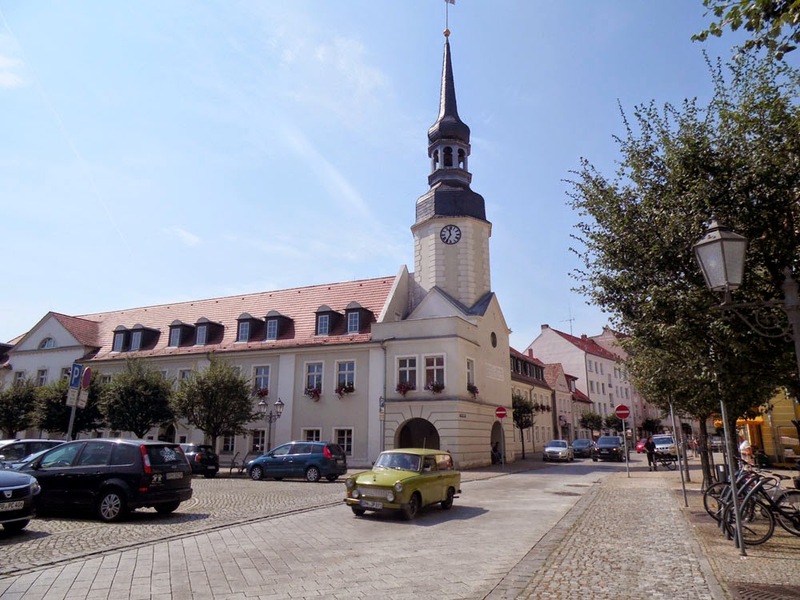 Spremberg is a typical former East German town. That is, it has a newly re-built market place and Rathaus, pristine streets lined with modern, bright new stores, and seemingly few people. Around its edges are the usual Plattenbau high-rise flats, and the crumbling remnants of the last century that haven't yet been rennovated to within an inch of their lives. 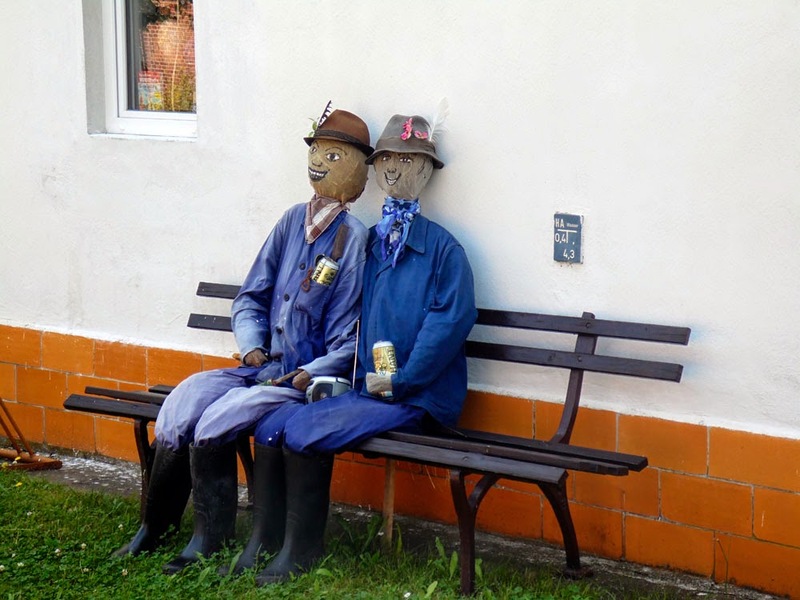 Spremberg is not your typical East German town though. 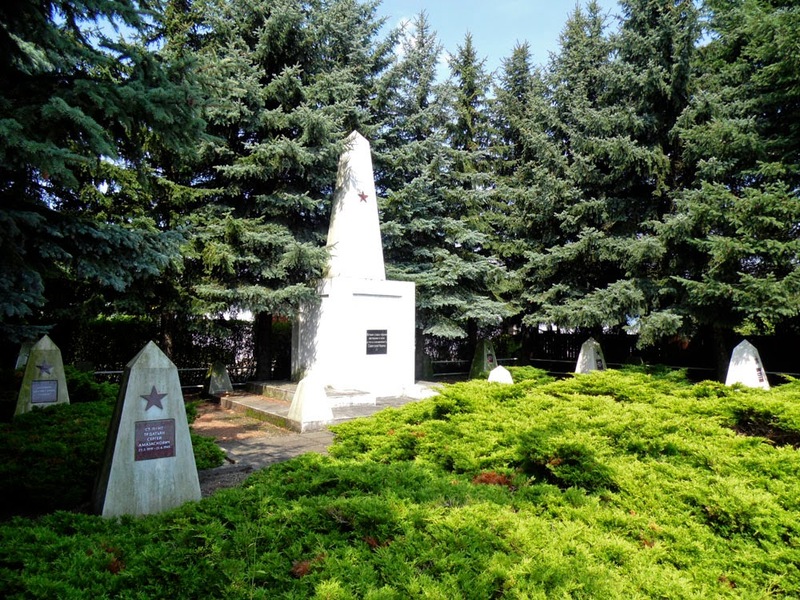 For one thing, it used to have a claim between 1871 and 1920 to be the geographical centre of the German Empire. 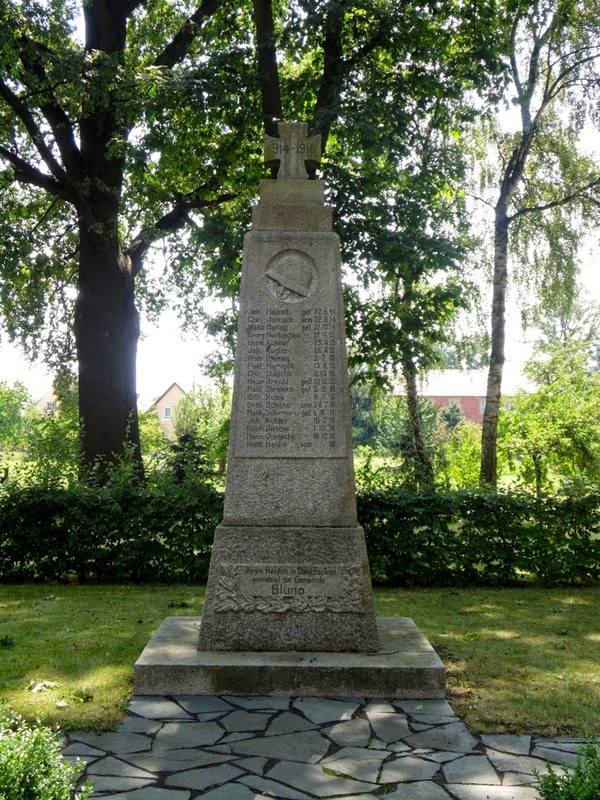 There is even a monument marking this fact in Spremberg. Now, with East Prussia and other bits of the former Deutsches Reich gone , Spremberg is only ~25km from the Polish border. (If you are the slightest bit interested, the geographical centre of modern Germany now is not far from Erfurt, which we visited two years ago). 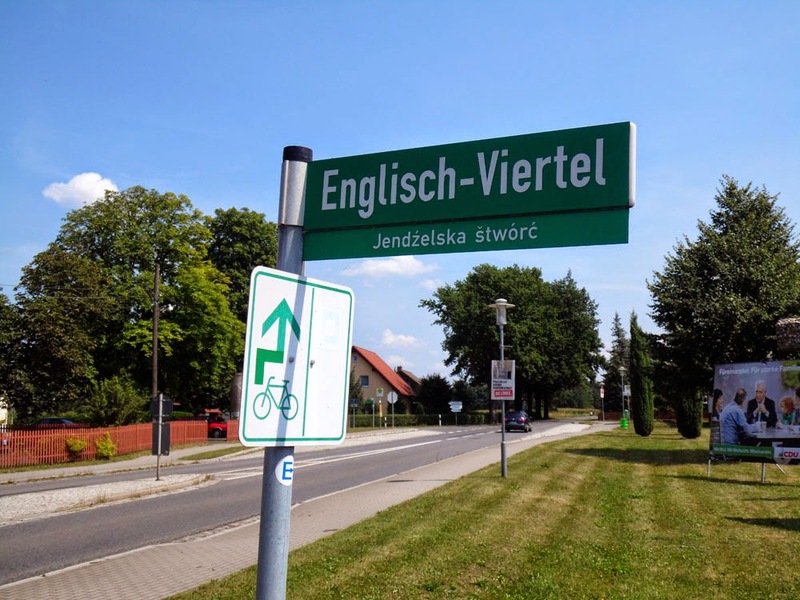 For another thing, it is now the geographical centre of Lusatia (German Lausitz, Sorbian Lužyca) an area of Sorbian language and culture, where all the road-signs are bilingual and the people have their own (Slavic) language, churches, folk-art, cuisine, and traditional dress. It is a bit like being in a different country without leaving Germany. Yes, just like visiting Wales, but it's not raining all the time (mae'n ddrwg gennym i bobl Cymru!). 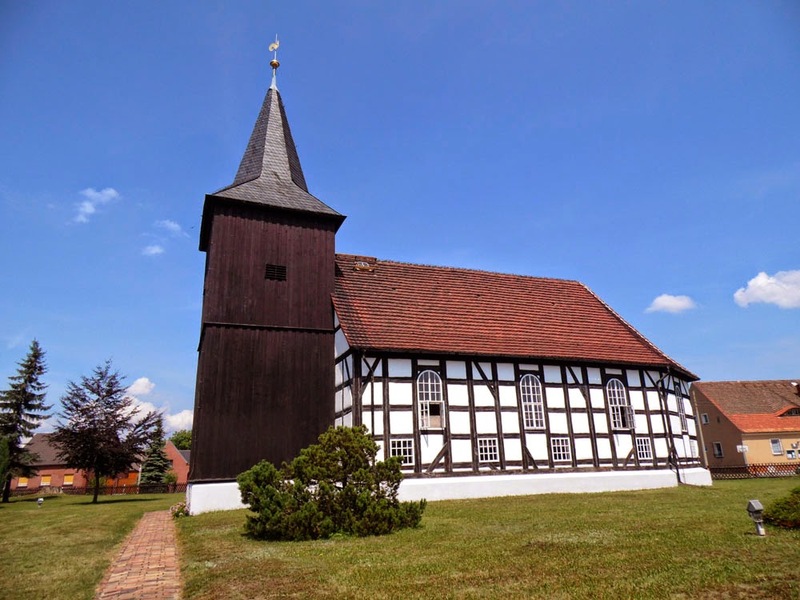 The Sorbian name for Spremberg is Grodk, by the way. 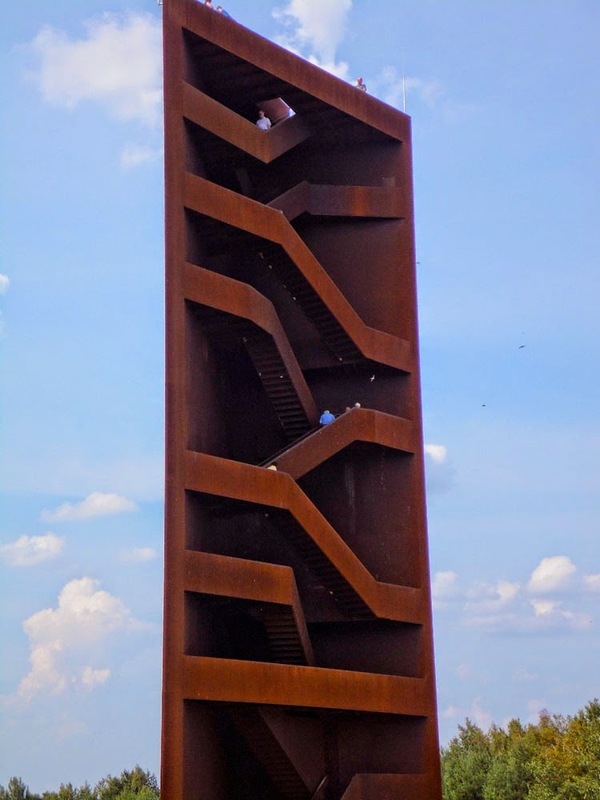 There might be a bit more to Spremberg (indeed there is; a Schloss and a Bismarckturm for example) but we were eager to cycle on to a place called Schwarze Pumpe (literally, the 'black pump'). Not 'Oompa Loompa', which some daft idiot kept calling it (hi!). 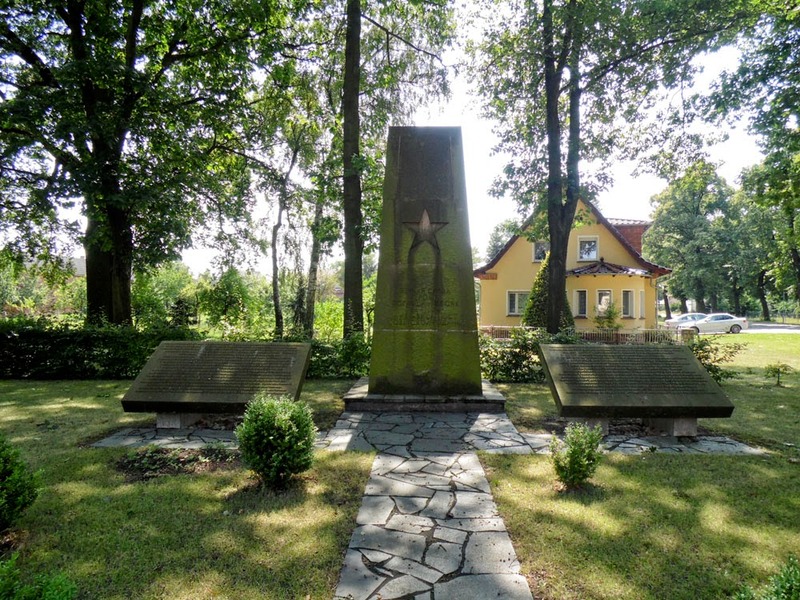 Next to it there is also a memorial to the dead of the Red Army that had fallen here, another reminder that this used to be East Germany, and also that even this far south was in the path of the advancing Soviet Army, as they fought there way into Germany at the end of WWII. 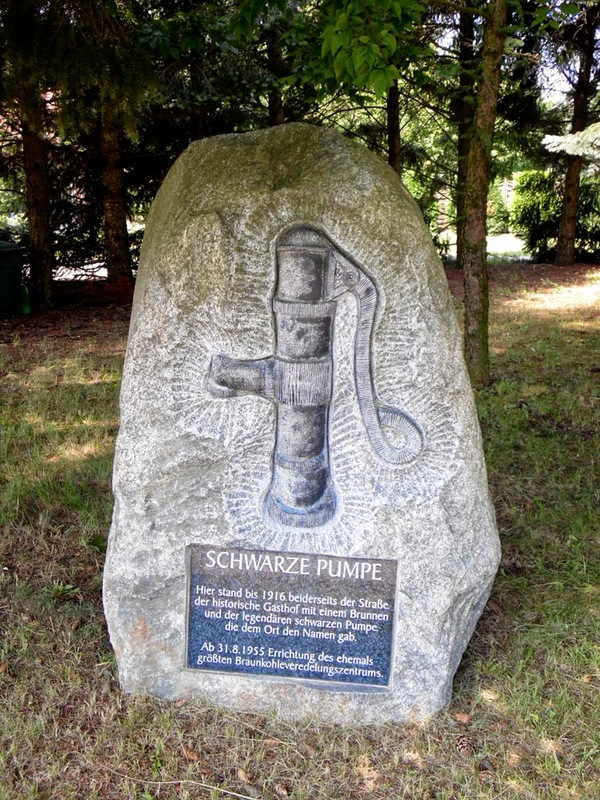 Schwarze Pumpe is famous amongst environmentally concerned circles because it is the site of an advanced carbon-dioxide neutral coal-power station which claims to be emissions free. Whilst some Greens applaud this initiative (as do the locals, who have benefited from much-needed jobs and a large investment from giant power provider company Vattenfall), others criticize continuing with fossil-fuel technologies, and would have preferred the investment and research to have gone into sources of alternative energy. 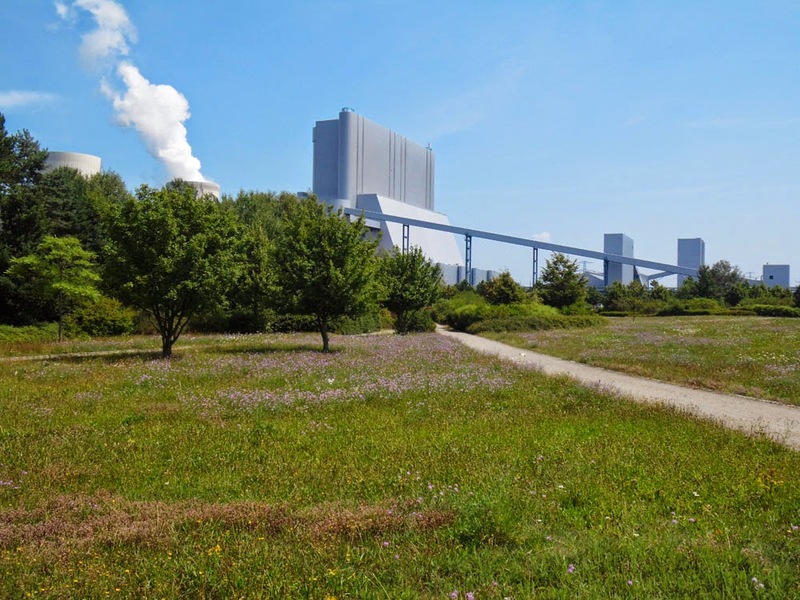 Whatever the pros and cons of the argument, the scale of the power station is certainly impressive, and Vattenfall have put a lot of work into landscaping the environment to be nature-friendly; here is my blog post about a nature reserve in the shadow of the cooling towers. Cycling West from Schwarze Pumpe on the B156 we found our planned journey blocked by the closure of a bridge. 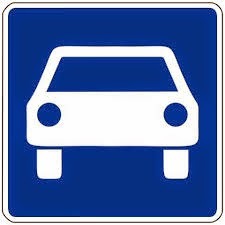 We could have made a detour by going down the B97, but do you know what this road sign means? No, we didn't know either, and it was clearly signed on the B97. White on blue, it looks like a motorway sign. But the B97 here is just one lane each way with no central reservation or hard shoulder. We also were at an traffic-light controlled intersection - not something you get often on the Autobahn. Luckily we decided not to go down this road, as we learned later that it signifies a Kraftfahrstraße which is a bit like an American express-way. You can't go on one of these roads unless your vehicle can go faster than 60 km/h, and I can't pedal that fast! 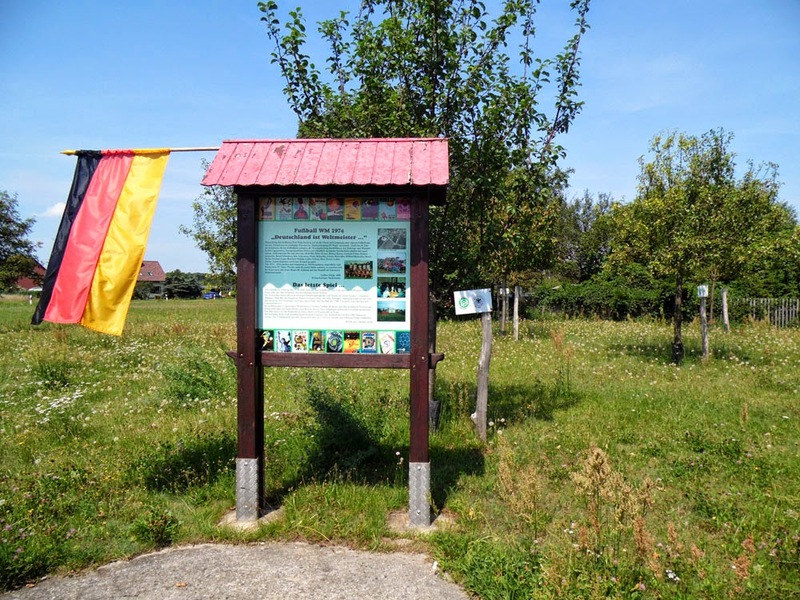 Instead we diverted through the small village of Terpe.On the edge of the Dorf we came across a piece of land with eleven trees each with a Deutscher Fussballbund sign tied to them, and an information board. Intriguing. The information board tells you that this is a Weltmeister-Park celebrating the Weltmeisterschaft. (football World Cup). A local football team was set up in Terpe, inspired by Germany's success in the 1974 World Cup, and here used to be their club-house and football pitch. Sadly, the last game was played here on Sunday, 20.09.2004. 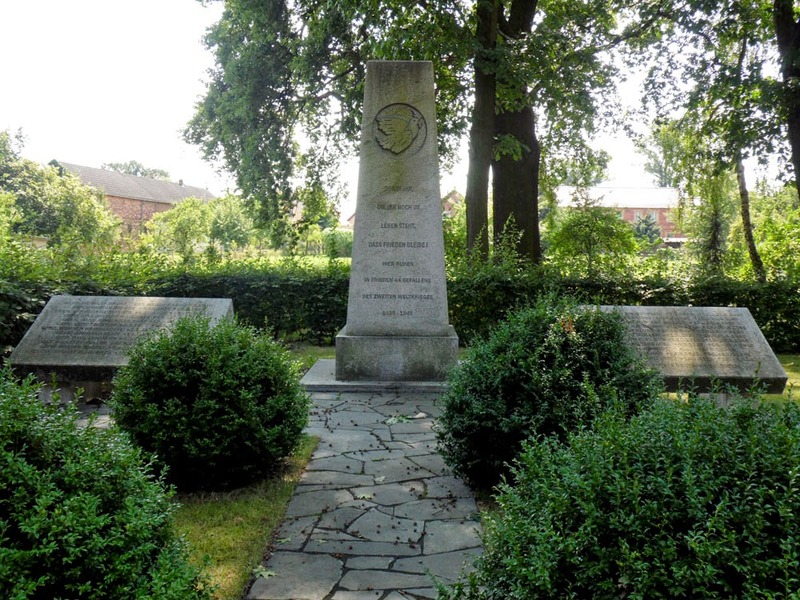 But, with help from funding from the the states of Saxony and Brandenburg, an orchard was set up here to commemorate the football World Cup champions of 1954, 1974 and 1990. No prizes for guessing who they were, but no mention yet of the champions of 2014. Eleven trees = eleven football players in a team, of course. You see, if you did't have to take these serendipitous diversions then you wouldn't come across an orchard dedicated to the World Cup, would you? 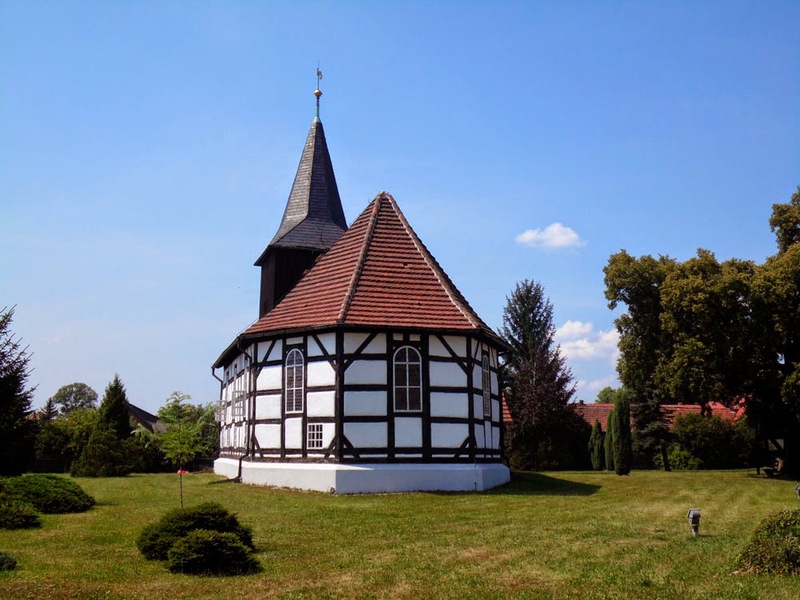 Next village along, and across the Brandenburg border into Saxony, is the even smaller village of Sabrodt (Zabrod in Sorbian). Here was another unexpected curiosity, an Easter egg museum (Ostereimuseum)! This isn't as crazy as it first sounds, because there is a strong Sorbian folk-art tradition for painting really intricate and gorgeous-looking eggs. 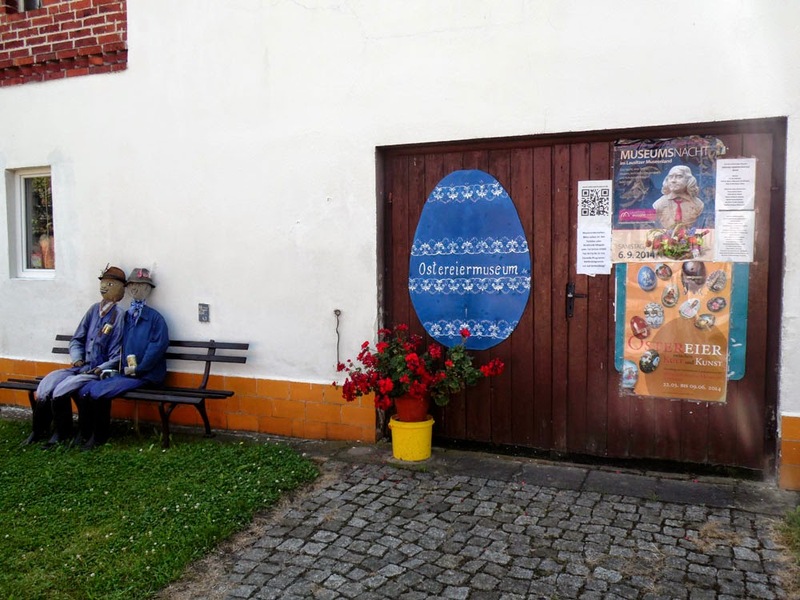 At this museum there are Easter eggs from all around the world, but mostly Sorbian decorated eggs including the winners of the annual Bautzen Sorbian Easter Egg competition. I am posting them here in case military reasearchers happen upon them and they might be useful. Bluno seems quite a small village to have so many lives lost from here, and I have not read about a notable battle in the area. So far we had cycled for hours around the so-called 'Lake District' and not actually seen a lake. Soon we would come across lots, as we eventually came across the Partwitzer See where there was also an Information Centre and a refreshment wagon selling ice-cold Himbeerlimonade (raspberry soda) under shade. The Partwitzer See is a magnet to sun worshippers, jet-skiers, sail- and paddle-boarders, and in-line skaters and cyclists careering along the well-tarmacked bike path. But not so much of a magnet that you couldn't easily find a spot on the beach. It is amazing to realise that here used to be an enormous open-cast mine - the Tagebau Skado - which before its closure in 1978 had dug out 240 million tonnes of 'brown coal' (lignite). Flooding began here in 2004 with water from the Schwarze Elster river, and it is now complete, with 133 million cubic metres of clear water. There are a large number of lakes just like this in the Lausitzer Seenland, all former mining pits that have been flooded (by the way, the mascot for the region is called 'Pit', from the English word for a mine). Some of the pits are in the process of being flooded, whilst some are still being mined. 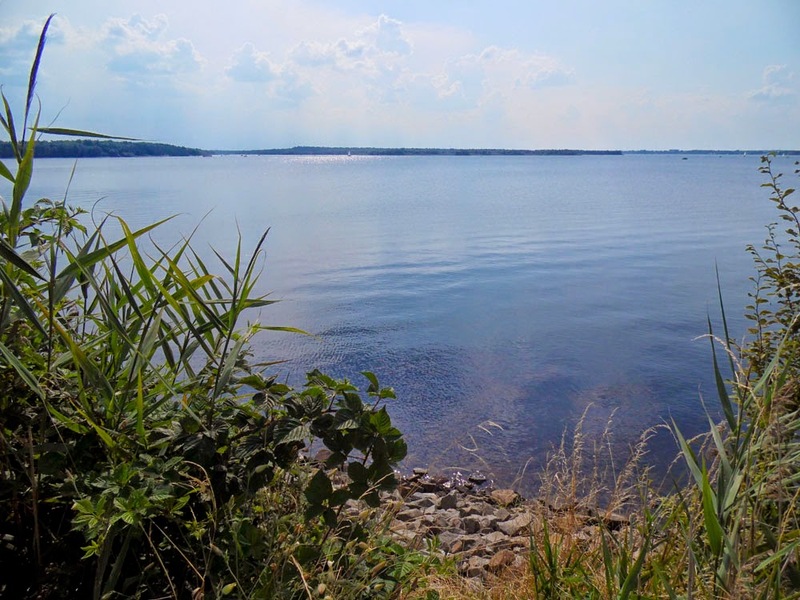 The central lakes are planned to be connected by canals to make a navigable 'lake chain' ( die Lausitzer Seenkette ) and by 2018 the area is going to be the largest artificial lake-district in Europe. 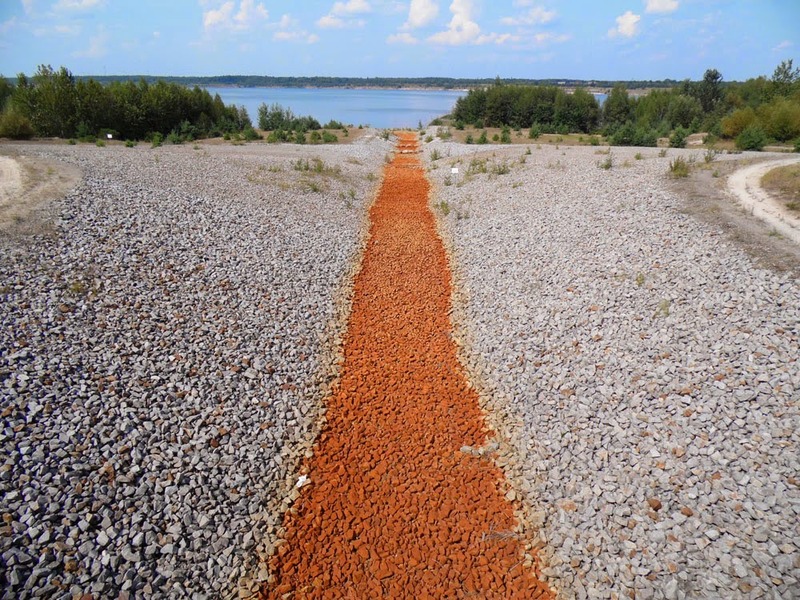 Here is a photo of one of the channels between lakes which are currently used for regulating water levels as they are gradually filled up with fresh-water. When the levels equalise, the channels will become canals and boats will use them. Pushing on, we cycled down to the Senftenberger See and along the North bank to Senftenberg itself. Here are wonderful, tantalising views across the lake, which was again a former open-cast mine and was flooded between 1968 (when the mine closed) and 1972. In 1973 the bathers and water-sport fanatics flocked from across East Germany. From heavy-industry mining-town to seaside resort - The Lausitzer Ostsee - in only five years! 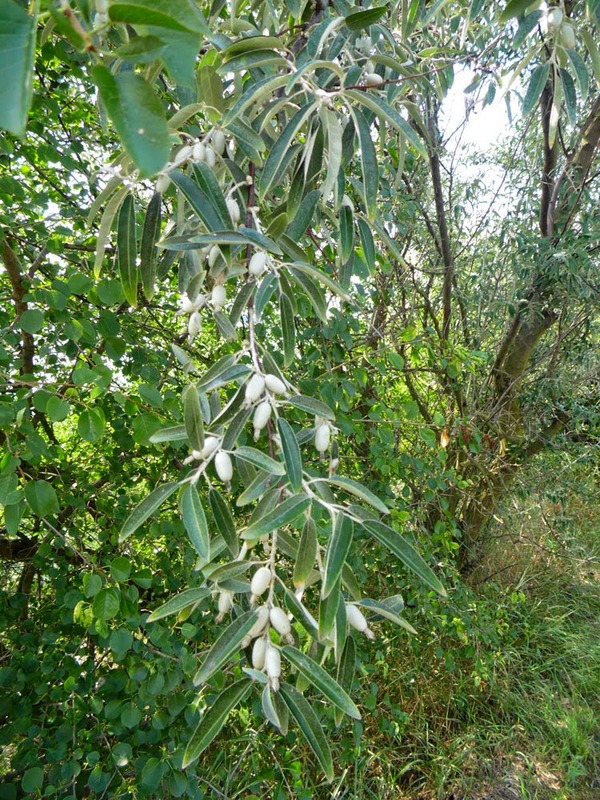 I was also amazed to see olive trees flourishing on the lake-side, all adding to the feeling that we were beside some Mediterranean or Italian lake (Lago di Garda for example). 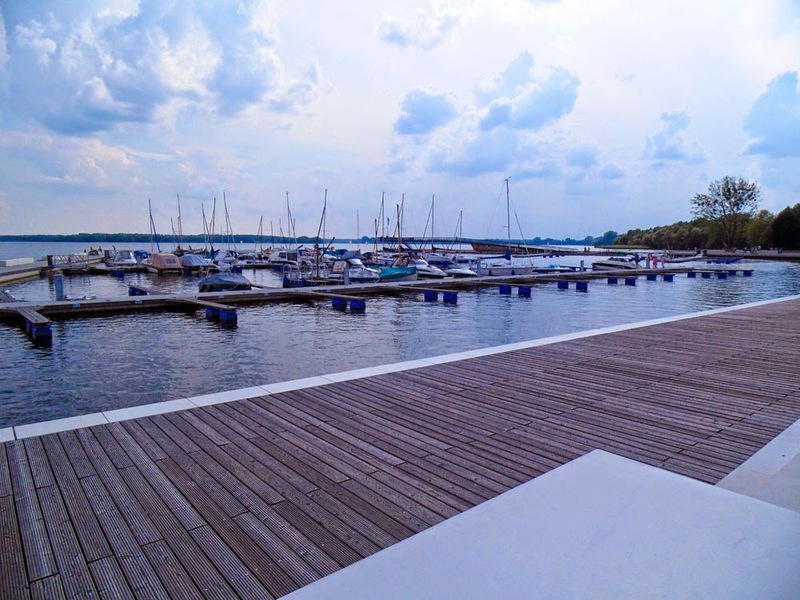 And so finally we made it to Senftenberg, which is exactly like a seaside holiday resort with a marina, and FKK beaches, and ice-cream, and buckets and spades, and EVERYTHING! Hang about, did someone mention ice cream? Oh yes, we had some delicious double-scoop ice creams resting beside the marina gazing across the blue lagoon with only a spoil heap and mining towers on the far horizon to remind us of what a strange transformation the area has had. Senftenberg is a large town with lots to occupy a visitor's time, but we had an aged cat back at home to look after, and we hurried past the Tierpark, museums, theatre, Schloss, fortress and so on to catch a train back home after a wonderful day's cycling in the Lusation Lake District. Note for travellers: there is a direct train from Senftenberg to Berlin, Gesundbrunnen, but it is much quicker if you go via Cottbus and change there. However, you only get five minutes at Cottbus, and there are no lifts to the platforms if you have bikes. We decided better to travel on the slower, but less crowded and more hassle-free train.